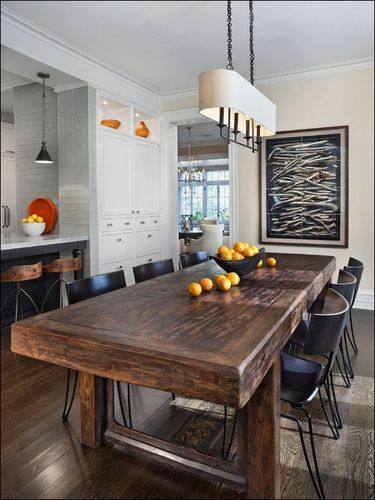 Here’s a good idea for a modern rustic dining area that opens off of the kitchen. The modern feel is accented with the use of contrast in the color scheme, furnishings and accessories. The squareness of the furniture enhances the rustic look of the table and combines with the modern for an interesting result. Adding a striking accent color to a contemporary/industrial theme is a trendy way to make a statement. What’s even better is to punch up the style with a bright, even fluorescent or neon color, to add energy! 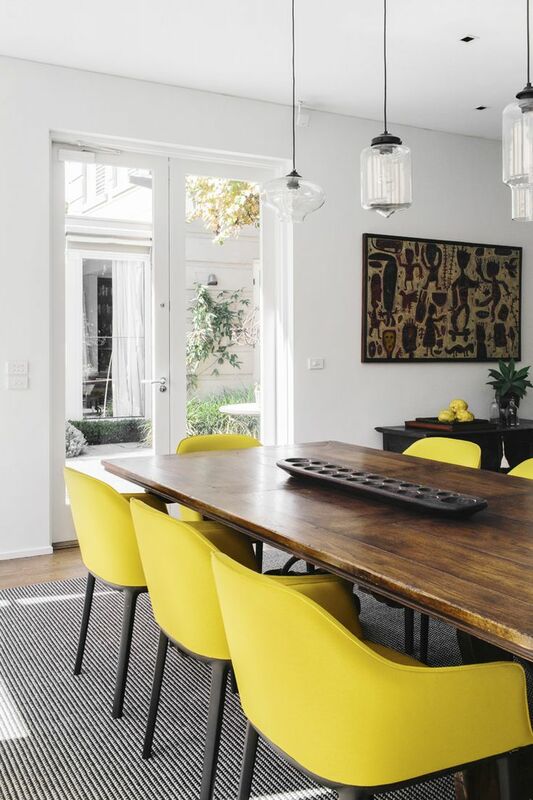 By keeping a neutral theme throughout the room and accenting with brightly upholstered chairs the dining room below has created a wonderful harmony. 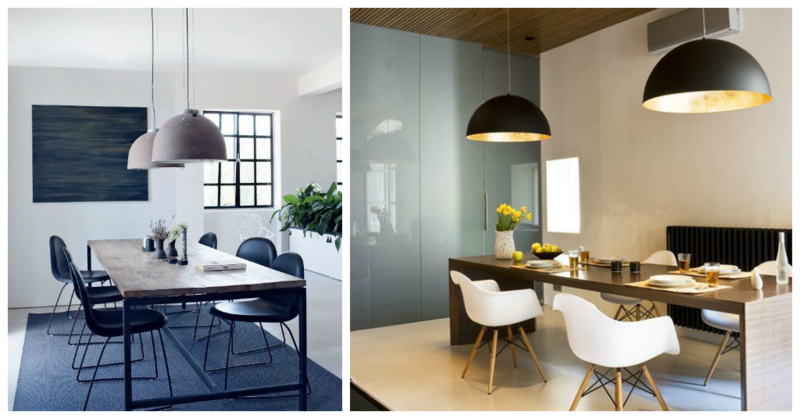 The lights above the table make a simple yet effective statement and help to pull the look together. 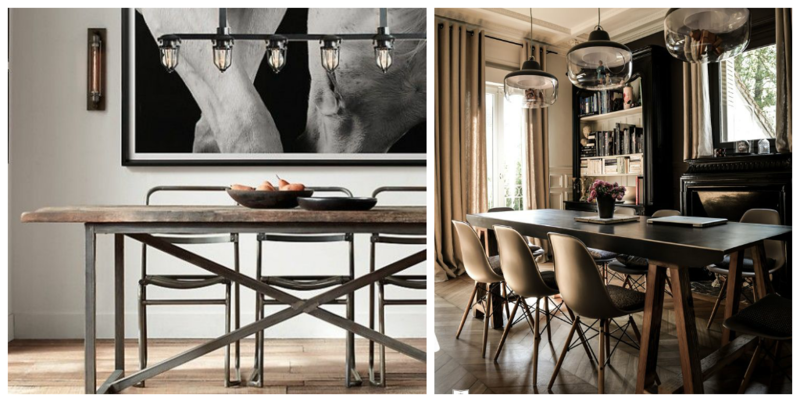 The look you want can be achieved by playing with the style of the furnishings, the lights and the colors to create a beautiful modern/rustic dining room. Combining vintage, rustic and modern accessories can create a modern-industrial style with an abundance of glass, metal or wood to add character and warmth. If you have a solarium and would like to find a way to “bring it in” to the rest of the family area why not give it a design upgrade? 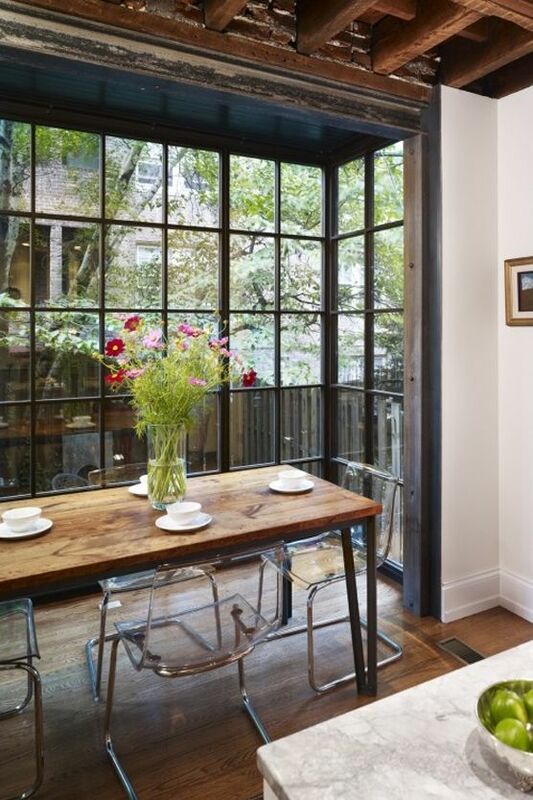 Here is an attractive way to tun the solarium into a modern dining room whose wood accents add a rustic feel. By combining neutral tones with natural elements the look comes together to create the modern/rustic ambiance. 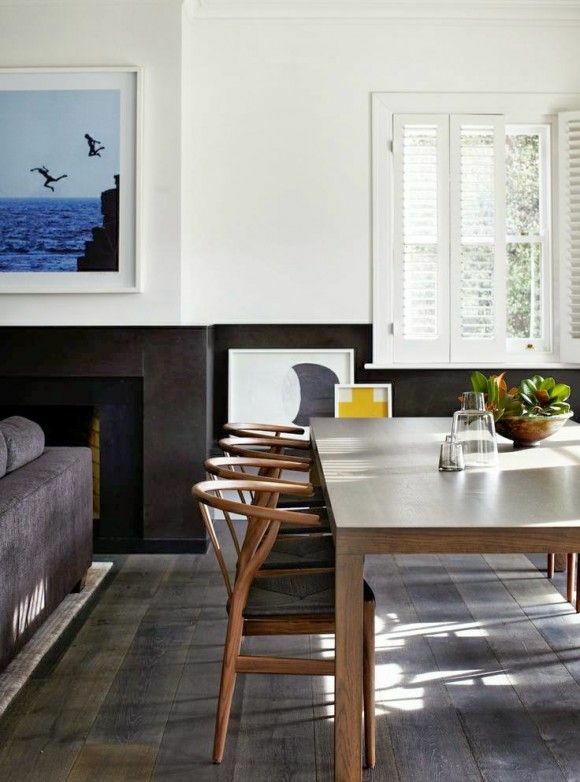 The simple lines of the dining table and beautiful windows all around give this perfect space added cachet! To avoid falling from modern/rustic into a traditional style you really need to limit the number of pieces in the room. If you opt for more imposing furnishings, limit the number of accessories to create harmony between the two styles. The result will be a mix of styles vintage and new, textured and smooth, in perfect balance! Here is a lovely dining room with a country influence. The muted earth colors are quietly comforting despite the modern furnishings. 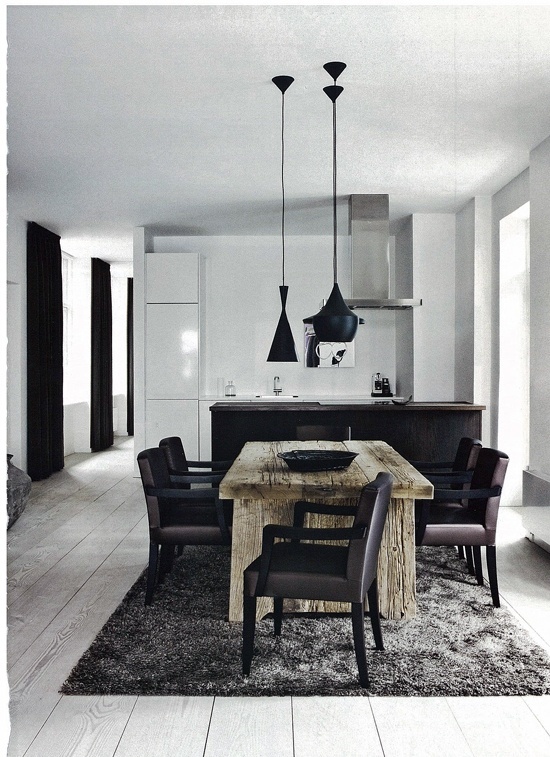 Black ceiling fixtures blend in well and create contrast with the wood dining table. Modern/rustic is a new and trendy style that warms up the often cool feel of an industrial style with wood furnishings on a backdrop of pale earth tones. Bright colors are used sparingly to add punch.